We are Bob and Michelle Hazlett of Titusville, FL. We have been workamping / volunteering for six years. 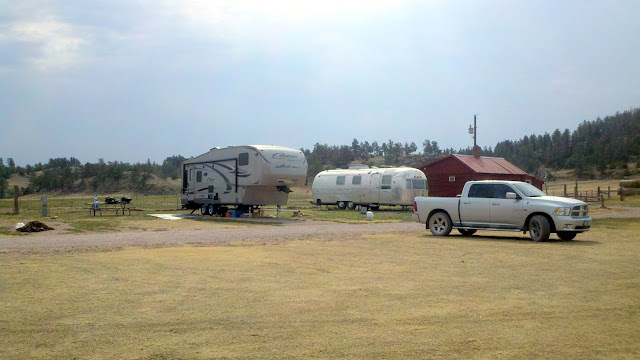 Campground jobs are plentiful, and we have had a few of those. But what excites us is finding an unusual situation with interesting work and a flexible commitment – that usually means volunteering. This was one of the best and it was in South Dakota. 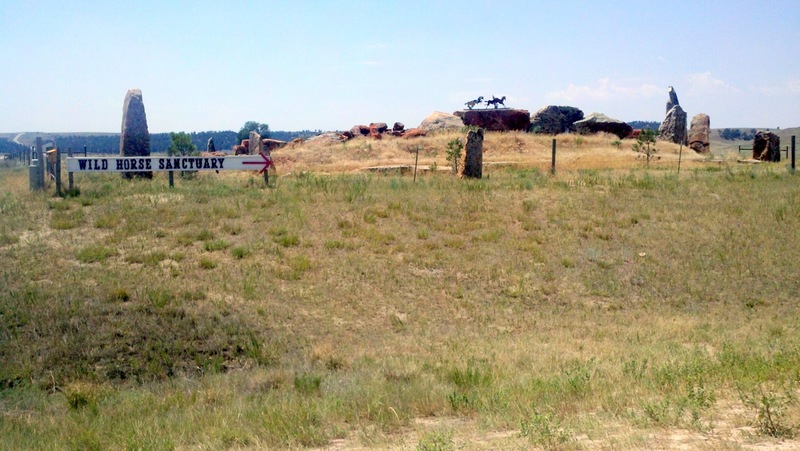 The Black Hills Wild Horse Sanctuary (BHWHS), an 11,000 acre sanctuary for rescued Mustangs, is just outside Hot Springs, SD on the southern edge of the Black Hills. 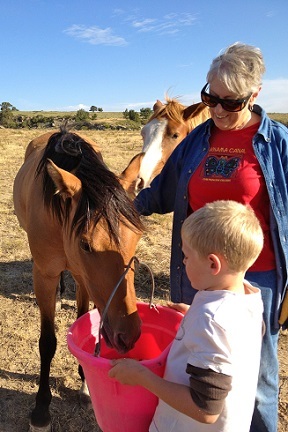 The herd is over 500 horses rescued from many places, most from Bureau of Land Management land. This workamping experience will go down as an "adventure of our lifetime". Ranching and horses was a different life for us. We had never done anything like it before. We found the horses, though wild, to be curious, playful, and friendly (at a distance). The ranch hands were hardworking and friendly with a great sense of humor. We city folks provided lots of material for their humor and we enjoyed the laughs too. Our duties were primarily feeding and watering the horses. Bob also participated in ranch “fix-it” chores and Michelle worked in the Visitor Center Gift Shop and helped with bulk mailings. Feeding was done from a feed truck. We drove along a predetermined route through the mountains surrounding the ranch and deposited piles of feed at various locations. Watering was a similar task. Water troughs holding 400 gallons of water are situated at various locations in the mountains. 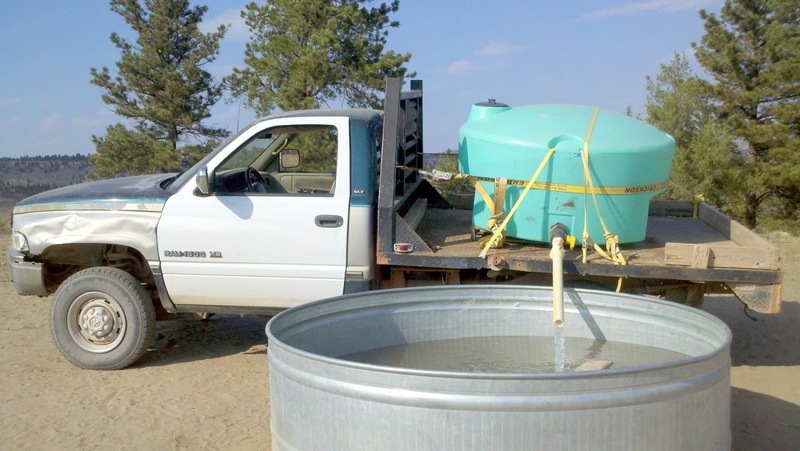 We refilled them using a 300 gallon tank mounted on a pickup truck. In the heat of the summer, that became an almost continuing chore. The ranch has a couple rental cabins. One was available for the long Labor Day weekend. So our son, his wife, and three boys joined us for a long weekend vacation. We took them out with us on the feed truck and let them interact with the horses. They still talk about that several years later. 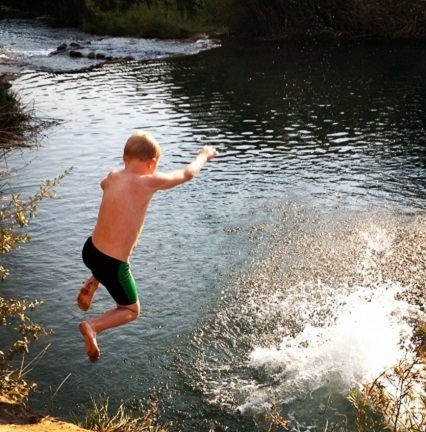 In the afternoon, we went a short distance to the Cascade Falls Swimming Hole for a refreshing dip in a real swimming hole. Be sure to check that out if you go there. Mr. Dayton O. Hyde is the owner of the sanctuary. He recently celebrated his 95th birthday and has a long history as a rancher, rodeo cowboy, author, and conservation activist. Listening to his stories was an absolute delight and his sharp humor would often sneak up and grab you long after the joke was over. I love that. Challenges came from the world of cyberspace. We had no problems with TV because we subscribe to Dish Network and my Tailgater antenna easily brought in the signal. Cell phone and internet were a different matter. Our cell phones showed no bars at the ranch so we looked for a high spot. While making our rounds with the feed truck, I kept my cell phone on and watched the screen for some bars. Finally we found a spot on a hilltop where I got four bars. It was a beautiful location. We could see all the way to Wyoming. I named it "Four Bar Hill". From then on we stopped there every day to catch up on phone calls and voice mail. For internet connection, we would go once a week into Hot Springs and spend most of the day in the library. Spending a day there was a pleasant respite from the ranch routine. South Dakota is an expansive, sparsely populated midwestern state where rolling prairies give way to the dramatic Black Hills region in the western part of the state. The Missouri River flows south through the middle of the state. Dominant cities are Sioux Falls in the east and Rapid City in the west. The Black Hills is home to two historical monuments carved right into towering granite peaks: Mt. Rushmore, the iconic depiction of four U.S. presidents, and Crazy Horse Memorial, a tribute to the legendary Native American tribal leader. And there is much more to see and do in the Black Hills region. This story is about workamping not touring so I can't do justice to any of these places in this short article. Let me just reel off some names. You can 'google' them on your own: Sturgis, Custer SP, Custer City, Wind Cave NP, Badlands NP, Wall Drug, Spearfish Canyon, Mammoth Site, Angostura Recreation Area (Cheyenne River), Cascade Falls Swimming Hole (43.319459, -103.563667). Workamping isn’t just about working. It’s also about making memories. We made many that summer at the Black Hills Wild Horse Sanctuary. This story was written by my grandson Joshua Hazlett for submittal to the Daily Flash Fiction Challenge conducted by Writing.com. All stories must be less than 300 words and contain at least one use of each of the three prompt words. The prompt words for this day were: stone, midnight, lamp. Regina Banks finished reading the story of the hidden Stone of Clexurs Den to her son Luke. Luke had already fallen asleep, so Regina turned off the bed lamp and quietly left the room. It was after midnight when Luke awakened to find the map on the lampshade of his bed lamp glowing. He was sure this had something to do with the story of the Stone of Clexurs. Luke dressed quietly, took the lampshade, and left the house. The map kept glowing as Luke made his way into the Black Mountains. He followed the trail deep into the forest, his only light being the glowing lampshade. The lampshade led him to a cave in the side of the mountain. From deep in the cave he could see a faint green glow. The passage into the cave grew tighter as he continued, getting so small that he had to crawl, but the glow kept getting brighter. At last the passage opened up into a large room. Resting in the center was a stone about the size of a bushel basket, and glowing bright green. Standing off to the side, was a shadowy figure, looking like a wizard from a mystery novel. “Touch the stone only if you dare” said the wizard. Luke was one who always took a dare. He reached out and placed his hand flat against the stone. “Is this an after school job?”, asked Luke.